Home » Copycat Restaurant Recipes » Lone Montana Ranch Hot Bacon Dressing – Don’t pass this one by! You too, can make hot bacon dressing at home. Lone Montana Ranch Hot Bacon Dressing – Don’t pass this one by! 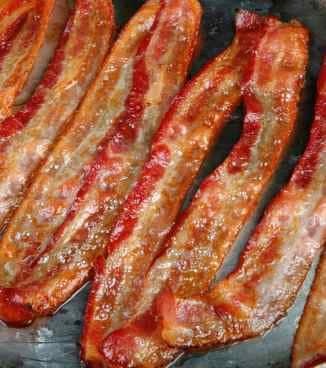 You too, can make hot bacon dressing at home. Hot bacon dressing is a delicious salad dressing that doesn’t get the credit it deserves. This goes very well over fresh baby spinach, or even poured over regular iceberg lettuce for a wilted lettuce salad. You can buy eggs that have already been pasteurized, and these are safer for people with compromised immune symptoms. Don’t pass this one by! You too can make hot bacon dressing at home. Sauté the bacon until brown; add onions and sauté until translucent. Drain and set aside. Combine egg yolks, pepper, salt, ground mustard, sugar, vinegar, Worcestershire, & dill on medium speed of mixer. Slowly add oil and blend well. Add bacon and onions. If too thick, thin with vinegar. Adjust the seasonings & serve within 30 minutes. Do not store. Makes 3 cups. This dressing was really good! I used it for a family gathering and everyone raved about it. I had to print out a copy of the recipe for everyone! I am concerned that the egg yolks are not cooked. I am looking for the bacon dressing that Bob Evans serves.